Is There a Connection Between The Book of Mormon and Polynesian Mythology? 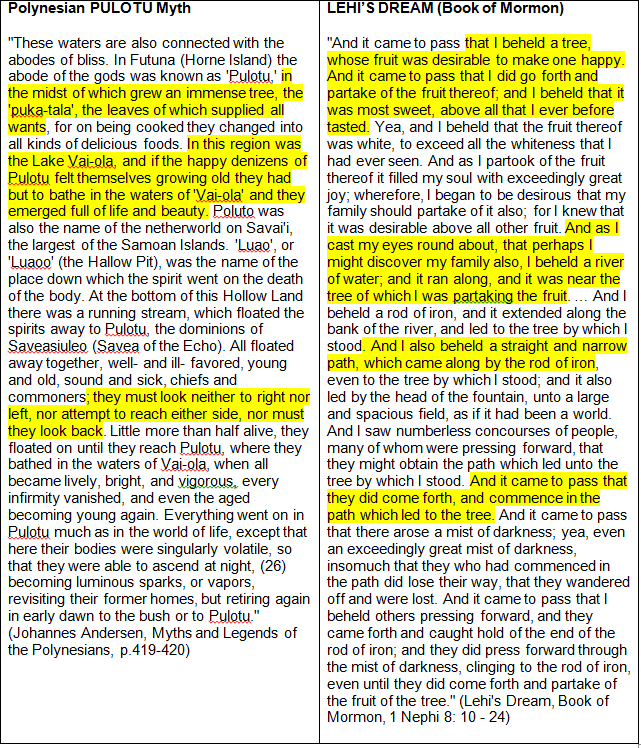 A personal view on a connection between Polynesia, Pre-Columbian America, and the Book of Mormon. Among the many topics discussed about Polynesians, how they colonized the many islands dotting a huge area of the Pacific Ocean is perhaps the most intriguing. Polynesian migration wasn't something I paid too much attention while growing up in American Samoa. I read a few articles about the subject, but cared less about how Polynesia was colonized. This debate was taking place in lecture halls and research centers that were far removed from my normal layman's world. Then just a few years ago, I became very interested in this topic when I came across some books about Native Americans and Polynesians in the Columbus (Ohio) City library. Most of the references I use in this manuscript are from those books, which are available in the public domain. As a member of the Church of Jesus Christ of Latter-day Saints, this topic presents something interesting because of claims by some LDS church leaders - that Polynesians are also descendants of a people whose story is recorded in the Book of Mormon. Obviously, the Book of Mormon is accepted by LDS members as scripture, but it's vehemently denied by others. Despite being snubbed by many people, I've decided to include it as an important piece of my narrative. You're probably thinking this is a clever attempt by some wacky Mormon to push his believes. It's true that I want to share my Mormon views, but I can assure you that my goal is seeking truths about my Samoan and Polynesian cultures which I hope to illustrate. This is a personal commentary on the germane information I compiled. I was excited by what I read and it motivated me to pursue this project and share my personal opinion whatever the consequences. 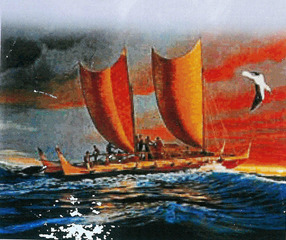 In 2003 I scoured the public library and the Internet for books and materials about Polynesia and Pre-Columbian America. In so doing I came across the text of the "Solo Ole Va" that was available online. I also found William Sullivan's book "The Secret of the Incas." These two things inspired me to begin writing notes. I have titled this paper "Ulu Lau". This word represents the kinds of words I've been seeking because, I feel, they reveal something important about the Samoan culture where they were formed. The Samoan word "ulu" means head. The word "lau" is leaf. These words describes the head leaf ("ulu lau") or the newly budded leaf of a plant. Reversing the order forms another Samoan word "lau ulu", which is "hair" or "the leaf of the ulu plant." The ulu plant is one of the most valuable plants to the Samoans. Dissecting words like these to find relationships and root meanings is what I look for. My search revealed some interesting words, including the word Togafiti. This word is made up of two words - "Toga" (Tonga) and "Fiti" (Fiji). The meaning of togafiti is 'schemer' or 'stratagem'. Why? I layout an explanation in my paper. Another interesting word is Malamalama, which I assert is a Samoan word that ties Polynesia to Pre-Columbia America. The Solo and other references I came across have convinced me that there are connections between ancient Polynesia and pre-Columbian America. I think these connections are more convincing than what the experts acknowledge. While there is a significant difference between the Samoan and pre-Columbian languages, a careful comparison of some words suggestively reveal common roots. The similarity of words was very interesting to me and it's one of the highlights of this manuscript. Those words are listed in Appendix "A". I wanted to find out if the Samoan "Solo ole Va" myth provides any insight into the Polynesian migration topic. I want to find out if there are traditions from the Pacific and the Americas that shed light on the true essence of the Solo. It was time to search for answers. Is the Book of Mormon story real? Whatever your position is about Polynesian migration and Mormon theology, I hope that you'll be patient and allow me to articulate my thoughts on these subjects. Open your mind to the possibility of a human history and stories about a past that is clouded in mysteries and often hidden by prejudices and ego. It's only a few pages long. Send me an email message to (imanua @ yahoo.com) if you want to read what I've done so far. My document, so far, has 145 pages. This is a work in progress, and I hold the right under copyright laws to this compilation. Thank you ... I hope you enjoy it.